creative savv: How does this frugal family celebrate a milestone birthday? How does this frugal family celebrate a milestone birthday? This past Sunday, my two daughters celebrated their 18th birthday! I can hardly believe it myself. They still seem so young to me. After all, when I was their age, I was much older. Whether we like it or not, we all have birthdays. So why not celebrate as best as we can?! 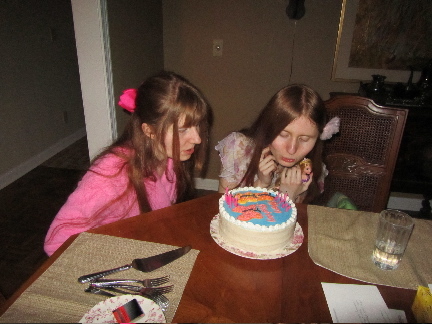 Julia and Grace's birthday was a milestone birthday. You don't turn 18 very often. I like to make the "big day" an extra special one for each of our family members. I'll tell you all about it. First of all, this isn't a zero-dollar budget birthday. We do have a healthy budget saved for each birthday. But that budget is in line with the rest of our expenditures. I give my kids choices in how they'd like their birthday budget spent. Would they like to have a fun time with friends? Would they like to eat out in a restaurant? Would they like to do something fun with just the family? The year that I let the kids paint on the family room wall, as the entertainment portion of their birthday party (as that was an inexpensive activity), the girls also chose to get take out burgers from McDonalds for all their friends that day. Another year they chose to go to the Seattle Center Fun Forest and ride some rides (costs money), but also chose to have a nice family dinner at home. For my son's birthday this past autumn, he chose to spend the budget on a ferry ride across the Sound, then an inexpensive lunch in a coffee house, for his birthday celebration. So, you see, the budget is just big enough to provide either some entertainment that costs money OR a nice dinner out in a restaurant. For the remainder of the day, I provide as many special moments as I can, without really spending much money. Breakfast in the dining room (we mostly eat breakfast in the kitchen or the family room), with the room decorated for the their day (these decorations will double as spring and Easter decor). Blueberry pancakes, with real maple syrup, and scrambled eggs. The real maple syrup is a splurge for us. It's quite pricey in our area, so I buy it rarely. This time, it came out of the regular grocery budget. The blueberries are from the freezer, the last of summer's harvest from our garden. Making breakfast special -- the family gathered at the dining room table. No extra cost. This idea I shamelessly stole from The Prudent Homemaker. It was darling and I knew my daughters would love this. 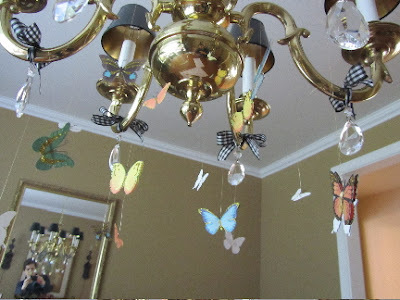 Brandy, from the Prudent Homemaker, had printed out some images of butterflies, cut them out and hung them from the light fixture. How very cute, right?! I could not get the color portion of our printer to work; so I broke down and bought some scrapbook butterfly stickers (but they were on sale). 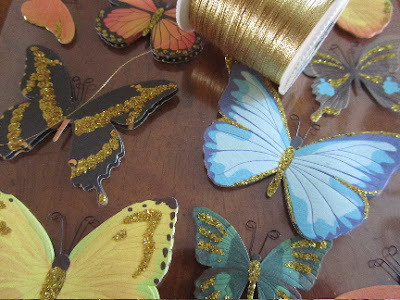 I had some gold thread in my sewing box, which I used to suspend each butterfly from our chandelier arms. I hung the butterflies at different heights, to give the illusion of a flurry of butterflies overhead. I plan on leaving the butterflies up throughout spring, then carefully, take them down and store with our spring decorations. Hopefully, I can get several years of use from these butterflies. We'll have to see how I can store them to avoid damage. I have to admit, I hemmed and hawed in the store over whether to buy these, but ultimately it was Julia and Grace's choice if they wanted their budget spent this way, and so we did. The cost for a sheet of 16 butterfly stickers, with tax -- $3.94. I bring whatever flowers I can find outside, into the house on birthdays. My son has a November birthday, so mostly for his birthday, I find evergreens and berry clusters. These bits from the landscape can make a nice table decoration on their own, that time of year. For Julia and Grace's birthday this year, we have petite daffodils in bloom. 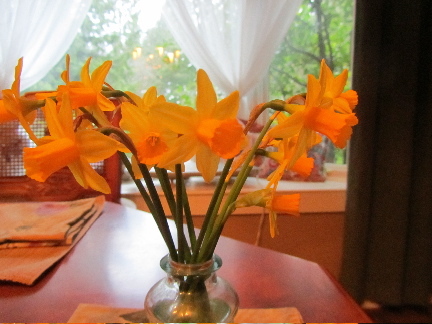 A small vase of tiny daffodils helped add some cheer to the table. Some years the Camellia bush is in bloom, and I float several blossoms in a bowl of water. No cost for the flowers. Decorating the dining room -- a lot of cheer, but not a lot of money! I have always, except once, baked and decorated the birthday cakes myself. There was the one odd year, when both girls really, really wanted a store-bought cake. That was their choice, and we used part of the birthday budget to pay for that one cake. Every other year I have baked a cake from scratch (I think they taste better, and I can't have dairy, so baking it myself ensures that I can eat some, too). Some years I've done quite elaborate designs on top. Other years, I've tossed a whole lot of M & Ms on the cake, and called it decorated. This year, I baked a yellow cake a few days early. I find it is easier on me, if I bake the cake layers a few days in advance, wrap in plastic and freeze, until I'm ready to frost. Then the day before their birthday, I get the layers out of the freezer, bring to room temp and frost. I stay sane for their birthday this way, instead of running around like a crazy woman trying to be the perfect birthday mom, with a million things on my to-do list. The frosting is a simple vanilla buttercream. And I went with the butterfly motif. 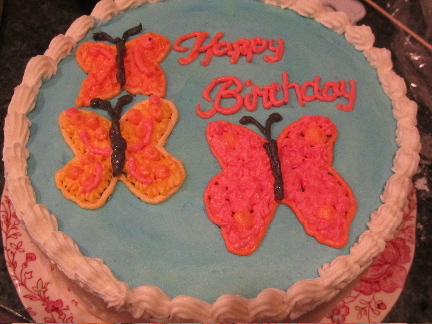 As you can see, my hand was shaky at times, and the cake is not perfect looking. But my daughters think it's wonderful and that's all that matters. Mostly, I just try to have fun with it, and not worry too much about it being just right. If you don't let it stress you out, cake decorating is really quite fun. A very delicious birthday cake, using ingredients that I had in my kitchen -- no additional cost! 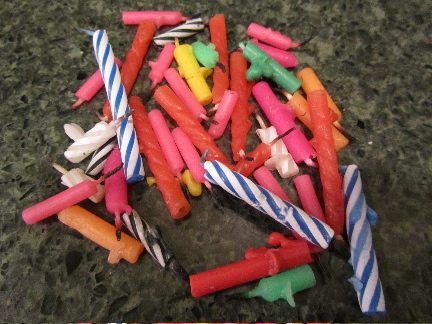 We reuse our birthday candles, with one rule of exception. If it will only be our immediate family, we use the used candles. If anyone else will be present for the cake, then we use new candles. Here's my thinking on that. The members of our immediate family directly benefit from our many money-saving strategies. Guests, do not experience that benefit, and so we wish to provide our very best for our guests. And the candles that are too short to reuse? Those are saved to make into fire starters for the charcoal grill. 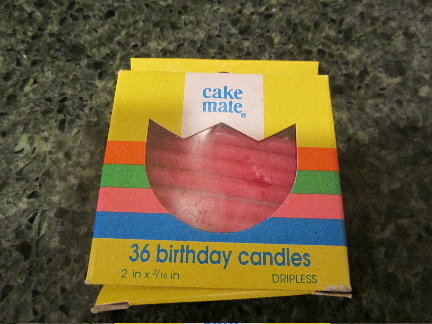 I'd like to say that these are gently-used birthday candles. But you can see for yourself, that we get as much mileage out of a tiny candle as we can. But they are my favorite price -- free! What about paper plates and paper napkins? Using what we have costs nothing. I like our regular dishes, and I have some fun cloth napkins in my large assortment to choose from. And in years that we have guests enjoying cake with us, it's always nicer to have a real plate on your lap than a flimsy paper one. We all like to compare what we're giving to our kids at varying ages. Even I do that. I asked my sister on the phone last week, what they gave their son when he turned 18. I think we just like to get a feel for what others think is "normal", and make sure that we're on track, given our own particular financial priorities. Since this is a milestone birthday, We wanted to give our daughters one gift that marked the occasion. This gift is ear piercing. Neither daughter has pierced ears, so this is a first for both of them. To go with the piercing, I gave them earrings passed down to me, from my mother and grandmother. And since we have made it a priority to save for their university educations (beginning September), the other gifts need to be practical ones. I had wanted each daughter to have a cheap, pre-paid cell phone for on-campus, so they can keep in touch with each other, and keep me informed of when they'd be coming home each day, as well as to have in case of an emergency. So for their birthday, they were each given the least expensive pre-paid phone; but these phones won't be activated until they have real need to use them (which may be this summer, depending on where they land summer jobs, otherwise just before fall quarter begins). And finally, the 3rd gift (we seem to give gifts in 3s whether for Christmas or birthdays). They are both realizing the value of knowing how to sew. One daughter saw another young girl wearing some fun fleece pants, while we were on vacation last month. I told her that she could easily make herself a pair, using my pj pants pattern. The other daughter likes to take thrift shop finds and embellish them. Last week she was adding lace trim to a simple dress to add some of her personality. So, we gave both of them a gift card to Jo-Ann Fabrics, to pay for a new project each. For this frugal family, the gifts are not over the top, but tend towards the practical with a bit of fun thrown in -- and both girls were really thrilled with what they received. Our son did something clever, as well. He gave them egift cards to ebay. On the envelope holding the printout with their egift card info, he wrote down some interesting facts about March 17: who died, what country was invaded, who was born, and who created something, on that day in history. Wikipedia has a list of historical events for every day of the year -- very interesting trivia. We reuse gift wrap, cutting off the shabby bits and pieces with tape on them. The wrapping paper in these photos was on my son's gift in November; and as it was, it was free in-store gift wrapping, so it didn't even cost us anything, then! If gifts are large enough, I find that I have a big square in the center of the gift, with no wrinkles, tears or folds. A piece like this can be saved and used on gifts of smaller size. 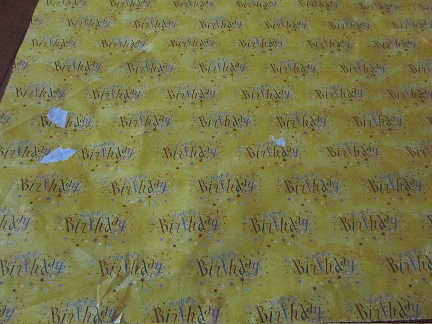 If I am out of tape, I use glue-stick to seal the wrapping paper. I like to use fabric ribbons. I buy them on spools at the fabric store, many yards for $1 -$2. The fabric ribbons can be ironed and reused numerous times. And they're handy to have around for craft and sewing projects, like making ribbon flowers to sew onto a young girls dress or top. Wrap and ribbons -- no cost. Let's face it, we all have a stash of boxed cards that need using up. I've been trying to use mine up for years. It could take many, many decades of birthdays to use them all! I collect vintage print greeting cards. 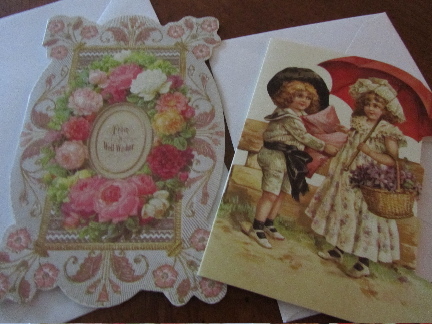 These two are from that collection, and now are our birthday cards to our two daughters. 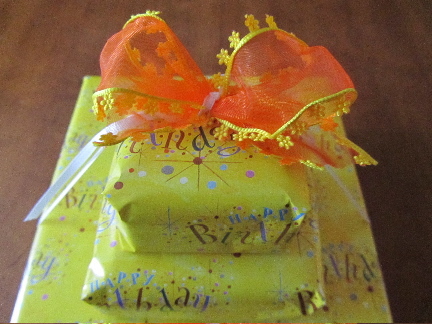 If you think it sounds too cheap to reuse gift wrap and ribbons, or use a boxed greeting card for a birthday card, this is how I see it. The less I spend on the items that don't have lasting value, the more I can spend on the event and gifts that they will hold onto for a while. 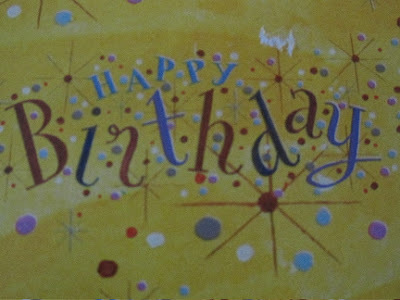 Birthday cards from my collection -- no extra cost here. Julia and Grace chose to have a nice dinner in a restaurant to celebrate the occasion. 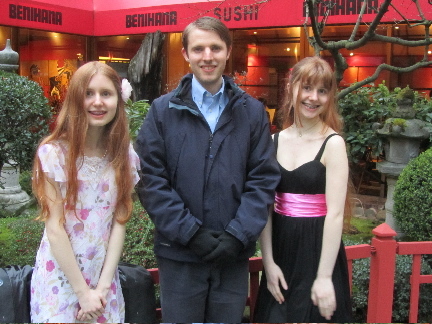 They had never eaten at Benihana before, and I suggested this as a unique restaurant experience. Benihana is a Japanese steak house, with a dinner-show put on by the chef at the table. Half of the table is the grill, and the diners are seated around. The chef performs a few tricks with his knife and fork, as he's cooking everyone's meals. I don't often find great value in eating in restaurants. But Benihana was an exception to this, with entertainment as part of the meal. We stayed well within our dinner budget. We looked over the menu online, while still at home, and made our selections taking the budget into account. We shared entrees and substituted a couple of appetizers for entrees as a way to keep costs down, and not have a ton of food wasted. As it was, my 2 daughters shared an entree and still couldn't finish it all. We do tip very generously when we order this way. Our tips are based on what 5 of us might have spent, had we all ordered entrees. With tax and tip, we spent $86 for dinner. I do consider how much our transportation will cost. The gas was paid for from our regular monthly gas budget. This means that I will have to take care when planning my errands for the next couple of weeks, to ensure our gas money holds out for the month. Parking in downtown Seattle is very expensive during regular work hours and on Saturdays. But on Sundays, street parking in downtown Seattle is free! It's limited to 2 hours, in most places, during the day, but after 5 PM, the limit is extended to 3 hours. Whenever a special occasion falls on a Sunday, we always consider downtown as a possible excursion venue, because of the free parking. Gas, covered, and parking free! Pictures, pictures, pictures! I like to print out at least a couple of the pictures right away, instead of just saving them all on the computer. Prints are nice to have. So often we never get around to looking at our digital photos. We have a photo printer, paper and ink, so we can print out a couple of photos at home for free. A while back I signed them up for Baskin-Robbins Birthday Club. About 6 days before their birthday, they received an email coupon redeemable for a kid's scoop of ice cream, for free. 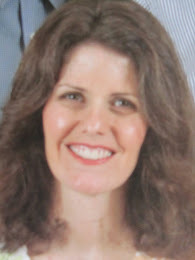 Other places I have signed up with include Sephora, Panera, Starbucks, Baskin-Robbins, Menchie's Frozen Yogurt, our local mall, and Payless Shoes, for their birthday programs. All of these businesses email or send coupons for free products or percentage off a purchase. We spent money in 3 areas for this celebration: decorations (the butterfly stickers), the gifts, and the dinner out. No additional money was spent on the cake, candles, flowers, plates/napkins, gift wrap, cards, transportation/parking, photos, and one of the gifts to each of the girls (the earrings). It's clear that one of our biggest expenses for this birthday celebration was the meal out. Most years we spend about half this amount if we're doing a restaurant meal for a birthday. Turning 18 is a big deal, so we spent on the high side. We save on costs where we can, so that we can afford what we think will provide the most value to mark the occasion. Julia and Grace's 18th birthday was a day to remember. We had a blast, but didn't break the bank in the process! How have you celebrated family birthdays, especially milestone ones? Happy birthday girls :) That sounds like a great birthday :) I like that you let them decide what to spend the money on for their birthday celebrations, so they can choose what's important to them. Do they ever want to do completely different things from each other, or do they generally agree? The cake is really beautiful, and at first I thought it was the store-bought one! And it sounds like you had a great dinner out. I also like spending more on good quality food when I go out. I think for my 18th I had an afternoon party with my extended family (it's a bit long ago to remember now!) and for my 21st I had a costume party with friends and family. Both parties were at my parents' house, so were not too expensive, and my mum, sister and I did all the cooking. My parents also gave us each quite a valuable gift for our 21st birthdays. They gave me a laptop, which was great because I was living out of home and didn't have a computer. My sister got a contribution to her volunteer work in Africa and I can't remember what my brother got, but something similar. yes, they do sometimes have different ideas of what they'd like to do. But they seem to work it out between themselves. They are really good at give and take; it doesn't seem like one of the two always gets her way, but they each seem to have things the way they would like from event to event. As much as feasible, I've tried to give them choices in financial decisions, so that they'll have experience working within a budget when they're on their own. Your 18th and 21st birthdays sound like you had a fun time. The memories are what are lasting. How great that your dad could be in Brisbane for your birthday last year! I had moved away from my parents' area when I was in my 20s and so often celebrated birthdays without them. What's your next milestone? Is it 30? Have fun planning it! It sounds like you all had a great day! When I was a kid, my parents would take us out to dinner at the restaurant of our choice. We always enjoyed that! I think kids really enjoy "the choosing" part of their celebration. That's wonderful that your parents gave you this as part of your birthday celebration. Happy Birthday, Julia and Grace! Lili, the picture of them as little girls was adorable but made me a little sad--I bet it's felt like a blink in time since they were that age. I agree with you on comparing with others what they do for birthdays--sometimes it's helpful to know what the "norm" is (although that can get tricky, too). It sounds like you gave them a fantastic celebration. Isn't this why we all budget, so we can splurge on the occasions that deserve it? I think I spy you in the mirror taking a picture! Ha! I'll pass your good wishes on to the girls -- thanks! I was a bit teary-eyed when I was adding my message to their birthday cards. I had to keep telling myself that it was okay, we were just moving on to a new phase in our relationships, which would be filled with great joy, as well! Funny thing, at the table last night, one of them was referring to something from several years ago and she said, "when I was a girl. . ." We all cracked up, because it just still sounds so funny. They are my girls still! Being frugal really is all about choices. It's not the same as being "poor". You can be poor and be a spendthrift or frugal, and you can be well-off and be a spendthrift or frugal. I wish that concept was better understood by the larger society. For our family, we choose to economize in many areas so we can do the "big" things. That's what makes life fun and memorable for us! Yes, that's me! I'm horrible with a camera. I gave up apologizing for my poor photography a long time ago. I didn't even see myself in the corner of the shot until my very last proofing, and then just thought, "oh well, it would be a lot of work to go back and crop that one". So, I'm a bad photographer AND I'm lazy about some things! What a special day you created, I'm sure your girls appreciated it. I would store the butterflies between the pages of a phonebook or magazine. I love Benihana too. My brother took me to a similar restaurant in Shoreline (on Aurora) great entertainment. Thank you. Good idea on storing the butterflies. I'd like to keep them for as many years as I can. They're fairly sturdy, scrapbook stickers, not the peel and stick sort of stickers. It was freezing cold Sunday, and windy, which made the cold go right through us. So my son, the one with sense, put on his jacket and gloves as soon as we got out of the restaurant. But my daughters, flung their jackets over the railing behind them, so as to show off their dresses. Men and women just have different priorities! We have quite a high gift budget for our family - Christmas and birthddays. A set limit for those that we buy for. We do not buy the kids gifts or treats throughout the year (my 4 stepkids) as they have plenty that they receive as have two entire families, 3 Grandmas and 1 Grandpa plus Aunts and Uncles. We generally eat in as taking a family of six out to dinner costs a fortune, although at least once a year we do splurge on it. I think it is a great idea you let them choose how to spend the budget. My stepdaughter had those stickers on her walls in her room at our house! I find it interesting to know how others do things, like celebrate special occasions. Yes, taking 6 out to a restaurant can be so expensive. And so, with 5 in our family, eating out is a big deal for us. I would prefer to go out once or twice per year, but to a restaurant with excellent food, service and/or entertainment, than to regularly eat at cheap take out places with mediocre food. I think our family really appreciates the times that we do eat out, because they are few and far between, compared to the experience of many of my kids' peers. My gosh, that's quite the elaborate and thought through birthday celebration! I totally love the pictures of your girls, has one always had bangs and the other not? And the butterfly decorations are just wonderful. Birthdays in my family were never really a big deal. I always had a sleepover party, but don't remember any gifts of note. Although, one year I decided for some crazy reason to give goldfish as party favors. I have NO idea why I thought this was a good idea, but we bought a bunch of plastic fish bowls, and each girl at the party received a goldfish. Well... as fate would have it, my cat thought that the goldfish was wonderful entertainment that I had provided specifically for him, and when I came home from school a few days later I discovered, to my horror, that he'd knocked the bowl on the floor and eaten the fish! Soooo, the next weekend, my dad & stepmom took me out to eat for my birthday. They had been out of town, and knew nothing about the goldfish party favors or the cat-eating-fish incident. They gave me a present, and when I opened it up I discovered a lovely framed photograph of a kitten staring into a goldfish bowl! They said they saw it in a shop on their trip and instantly thought of me. Oh my! Must have been some sort of bizarre ESP situation going on there. 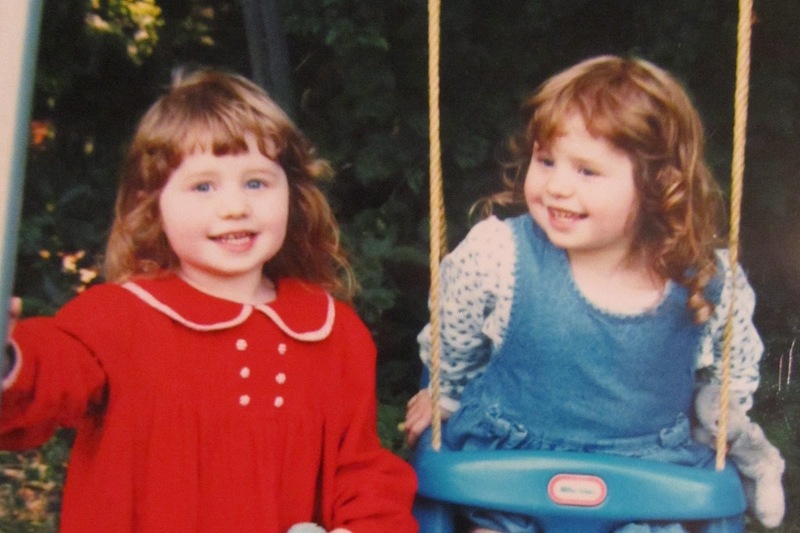 They both had bangs for many years, then one of them chose to let hers grow out, about age 10 or 11, and they've kept to their own look since. It does make it much easier for others to tell them apart. How tragically funny, your kitty and the fish! And how amazing that your dad and stepmom would choose that particular picture for you. When I was growing up, we had a cat and fish. When we went out to run errands with my mom during the day, she'd have to put the fishbowl on a shelf in the closet, to keep the fish safe. The fish provided hours of entertainment/torture for the cat. Our kitty was sure that someday she'd have a nice little snack. Never happened. Too funny! Wouldn't you have loved to see just what happened after that photo was shot?! Neither of you probably read kid's books, but there is a series out called Mr. Putter and Tabby. It's about an old man and his cat. In one book, Mr. Putter gets a goldfish. All these comments reminded me of the book. It's a riot. I do occasionally wander through the children's section of the library. I'll see if they have the Mr. Putter books. You know, when my mom would put the fishbowl in the closet, and close the doors. . .well, when we'd come home, the cat would be sitting in front of those closet doors, and occasionally slip her paw under the door to see if she could pull it open. I am sure this Birthday was a little emotional for you-having your daughters turning 18, knowing college is just around the corner, larger life decisions to be made. I remember feeling a little weepy-I tend to be a little emotional over everyone growing up!! Oh well-enough about that! It looks as though the Birthday celebration was well planned, executed and thoroughly enjoyed by all! I like your butterfly theme-so popular this season and who doesn't like a wispy and colorful butterfly! It was a bit emotional. I have to keep reminding myself that we are just entering a new phase, that will be equally joy-filled! I am so glad that butterflies have been popular this year. I adore butterflies and all they symbolize with new beginnings and rebirths. they are a reminder that there is always much to look forward to. I'll pass on your good wishes to my daughters -- thank you! Happy Belated Birthday, Grace and Julia! When I was growing up, my mother was very organized with birthdays (there were four of us.) We got to have a party every other year and she had us coordinated on off years. The parties were always at home and a lot of fun. 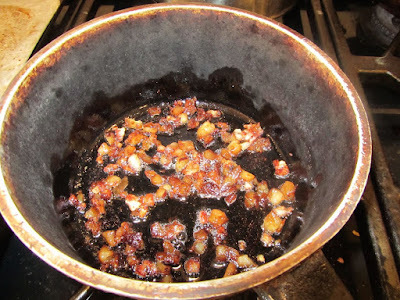 Also, every year on our birthdays, we got to chose what we had for supper that night. However, the best part of having a birthday was that you didn't have to wash any dishes or do any chores on that day. We all loved that and sometimes held it over the other sister's heads. With my own boys, I did the every other year party thing that my mother did. Sometimes they were at home and sometimes they were out like a bowling party. Since they have gotten older, we try to do something as a family. One of them has a birthday in a couple of weeks and he wants to see the symphony do Disney's Fantasia. I bought the tickets last night. I will pass on your birthday greetings to my daughters -- thank you! It sounds like you have great memories of your birthdays. I love the part of not having to do chores on your birthday, AND making sure that your sisters knew that you didn't have to do any chores on that day. Oh, Fantasia would be wonderful to see done live. We've watched the video of it so, so many times. I hope you and your family enjoy the performance. It should be a memorable birthday for your son. Your kids are lucky that you put so much thought into their birthdays! At our house, Link always wanted to do things with friends, so we'd have a family meal at home or at grandparents' home one day, and an activity on another. The choices were: an activity such as a movie or the Clay Cafe with 1-3 friends, a lot of friends for an evening party, or a smaller number for a sleepover. The parties at home would involve homemade snacks like cake and popcorn, but we always bought Pocky! Those sound like very fun parties for Link, and a way to include both a family event and friends' one. I'm sure Link remembers his birthday celebrations fondly. What is Pocky? I know of a cookie stick called Pocky. Is that it? Yes, it's them - a must for anime fans! Oh, that makes sense. My son has a couple of friends who are really into anime, and they have often had boxes of Pocky with them. It sounds like your daughters had a very special day. Good job putting it all together for them! My oldest (daughter) turned 13 this past October. This was a milestone for us, as we now have a teenager in the house! Grammy and Gramps came over on her birthday (it was mid-week), for a nice family dinner and family gifts. Then on the weekend, my daughter had about 20 of her girl friends over for a slumber party. Imagine, 20 giggling, squealing girls in the basement keeping us up half of the night! But they had a very fun time, and I was glad to do this for our daughter. I love those butterfly stickers. Where did you find them? The stickers are a Martha Stewart product. Our Jo-Ann Fabric and Crafts carries them here, in with the scrapbooking supplies. Good luck finding some. I'll pass your birthday wishes on to my daughters -- thank you! I am seeing butterflies everywhere I go (fake ones, not the real deal, sadly). It must be a popular motif for this spring, or maybe all springs, and I'm just now noticing them! LOL! Thanks for your kind comments! Have a wonderful evening!